Time to get your Veg On, readers! I must admit, the end of summer bums me out a little. While I confess that Autumn is my favorite season, there’s definitely a downside…and that downside is the death of summer tomatoes. I’m donning my black and bringing out the tissues, because months of tasteless tomatoes are coming down the pike. 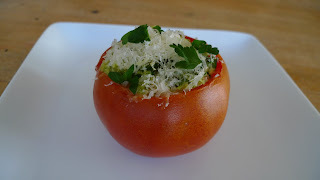 This dish is sort of a consolation prize; turns out, if you hollow out craptacular tomatoes and fill them with veggie/cheesy/herb love, and add a little kiss from the oven, you’ve got something that isn’t tasteless at all. These stuffed tomatoes are hearty enough to make a lovely lunch, accompanied by a crusty baguette and a nice wedge of cheese. And if you have any sense at all, you’ll pour a nice glass of wine to seal the deal. This dish also makes an impressive side for grilled steaks or roasted chicken, if you just can’t bear a meal without meat. You can also vary the kinds of vegetables you use in the filling; if you’re a green pepper hater, you can substitute mushrooms, or carrot, or corn, or anything, really. You can even get racy and add jalapenos to the mix. I love a forgiving recipe. So grab a few zucchini and jump in! You know you have zucchini hanging out in your kitchen this time of year–don’t deny it! Core the tomatoes, remove seeds and flesh. Turn upside down and let excess moisture drain out onto paper towels, about 20 minutes. Heat oil in a large saute pan over medium-high heat. Add onion and green pepper; cook until softened. Add zucchini, garlic and oregano and cook for 5 minutes, stirring often. Remove from heat. Stir in basil, eggs, 2 tablespoons Parmesan and salt and pepper to taste. Spoon mixture evenly into tomatoes. Sprinkle with remaining cheese. Bake in a buttered baking dish at 350 degrees for 20-30 minutes or until heated through and bubbly.